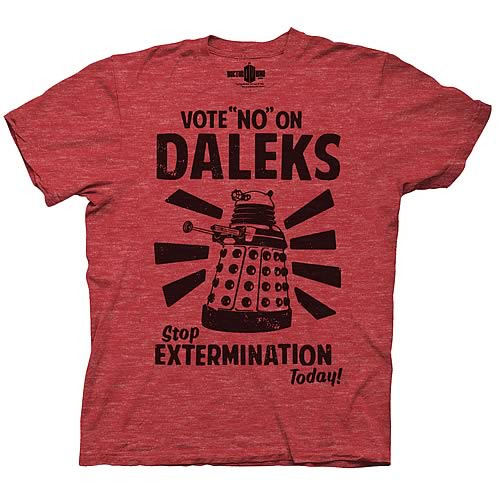 Vote "no" on Daleks and stop extermination today! Join the Doctor Who campaign against the mindless and senseless violence of the Dalek race with this Doctor Who Vote No On Daleks Red T-Shirt. Wear this T-shirt featuring the words "Vote "No" on Daleks. Stop Extermination Today!" in black on a red-heather background when it gets close to election time so everyone will know your political stance! T-Shirt is a high-quality, 50% cotton / 50% polyester red T-shirt that's machine washable.